Feathered Forays and other Natural Adventures – A place of exploration, a place of connecting with the natural world, even if we are in the city. A place of exploration, a place of connecting with the natural world, even if we are in the city. OK – this post is for animal lovers – this is the best encounter I have had with animals on a hiking trip. Japanese macaques have to be one of the cutest animals on the planet, particularly when you can share their space at a hot spring in the harsh Japanese winter. It’s only a 3 hour trip from downtown Tokyo, but I’d strongly recommend a longer stay, as we did in mid-winter February. The atmosphere and peaceful landscape in this part of Japan will hold memories for my lifetime. Japanese macaques at Jigokudani Monkey Park in Yamanouchi, Japan. Jigokudani Monkey Park is a unique hot spring and part of the Shiga Kogen National Park. The region is blessed with magnificent mountain peaks in the centre of Japan’s main island, Honshu. The winter environment is hauntingly beautiful, but challenging, for both monkeys and people. However, Japanese towns within these mountain ranges are well served by reliable public transport and communities that have lived here for hundreds of years. The first part of this scenic journey involves a Shinkansen or express train to JR-Nagano, which is the main railway station for Nagano city, which hosted the Winter Olympic in 1998. After arriving in Nagano, transfer to a privately run railway line, Nagano Dentetsu Express, for a final 44 minute local line journey to Yudanaka. Transferring from one line to another was slightly tricky, as this railway begins as an underground subway in Nagano, but once you find the platform, you’ll soon commence a journey through modern dormitory suburbs of the city, before the train starts squealing it’s way along curvy tracks to higher altitudes. Suburbia gives way to large towns, followed by stunning white wintery country landscapes. As the sun began to set over this vast mountain landscape, we arrived in Yudanaka – a quaint service town at the top of a deep valley at the end of the railway line. Snow was piled up along this railway line, but the trains still keep to their timetable. The Japanese could certainly teach UK and Australian railway companies a thing or two about running reliable, efficient public transport. Snow accumulates on the station platform in the middle of winter, prior to the arrival of a morning train. Upon arrival in Yudanaka, it was a a short 2 minute walk to our local Japanese hotel (ryokan) called Yudanaka Seifuso, where the rooms were spacious, very clean and comfortable. The common areas were also quite relaxed and welcoming, with a hot spring on the premises. After eating a wonderful Japanese breakfast at the ryokan, the hosts insisted on driving us to the entrance to the national park: communication was possible, even though our Japanese language skills were non-existent. I guess everyone who comes to this part of the world is heading for the same place. Typical scenic views through the forests leading to the hot springs where the monkeys live. The walk through the forest was like a magical childhood fairytale: a 45 minute walk through lonely wintery landscapes. It was so cold, but full of anticipation: almost like living in a real life fairytale like Hansel & Gretel. I didn’t have any gingerbread to find our way out of here, and had flashbacks to entertaining Japanese animation films that are set in dark forests. Visitors can wander through the hot spring area at their leisure, with amazing photo opportunities. Don’t be fooled, as these monkeys are mostly wild: don’t look them in the eye, as this is interpreted as aggressive behaviour. Snow monkeys do not normally jump into hot springs. This place is a very Japanese solution to a problem: these monkeys were raiding local apple farms in the 1950s, and local farmers were calling for their extermination. Fortunately, a local land owner grew an apple orchard deep in this valley and enticed the monkeys with additional food in the depths of winter. So now we are lucky to be able to visit this place, which is not wild, but a great example of humans and wild animals living together. Although they monkeys are mostly placid, you do get the feeling that this is still a wild special place, especially given the long walk back to the town through the forest. It’s just amazing to sit amongst some of our close evolutionary relatives and watch their family behaviour and social customs. My favourite part of this experience was just sitting in the middle of their group, observing the behaviour of family groups, young monkeys playing and the sedate chilled elders who just sit back and watch over their extended family. There’s no need to touch or pet these amazing animals, as you are already part of their community. Although this was an incredible experience in the beautiful snowy weather, I’m not sure that I would come here if there was no snow. It appears that the monkeys live a very different life when the snow disappears – I think they explore the mountains and rivers in the region and hopefully feed themselves on local plants. Getting here is really easy, even if you don’t speak Japanese. Yudanaka is accessible from Nagano by regular local trains on the Nagano Dentetsu Line. Skinkansen (bullet) trains link Nagano to Tokyo and express trains also go to Nagoya (and Osaka/Kyoto region). Yudanaka is a fairly large rural town with a wide range of restaurants and shops surrounding the local railway station which is at the end of the Nagano Dentetsu Line. Shuttle buses run from the centre of Yudanaka to the entrance to the national park – a trip of about 10-15 minutes. The town is also great for exploring and experiencing local Japanese small town life – quaint little streets, good local food in cosy inns and magnificent views across wild mountain landscapes. Have you ever unexpectedly stumbled across amazing photos on a website to the point where you are drawn to visit? This happened to me, with Zhangjiajie – a strange place of incredible natural beauty in central China, far from the major cities of this huge crowded country. Zhangjiajie is a large World Heritage Site with a dramatic geological landscape. Over 3,000 sandstone pillars rise over 200 metres above a valley floor – a geological marvel which is the result of the Australian and Indian continental plates pushing into Asia over tens of millions of years. In this part of China, lush mountain forests cross between temperate and sub-tropical climates, resulting in unique plant and animal life. The landscape is much like a real life Chinese landscape painting. Despite looking like an ancient Chinese landscape painting, there are no old paintings of the park, because the area was so remote and inaccessible until recently. The park has gained more recent fame, as parts of the landscape are said to have inspired some of the alien worlds in the “Avatar” film from 2009. Although this is a World Heritage site, Zhangjiajie is generally not on the itinerary for foreigners with limited time in China. It’s quite a journey from the major urban centres of China and it took a fair bit of research, some courage and determination to go there by ourselves. Even a basic grasp of Mandarin will help immensely if you are trying to navigate the park by yourself – but it is immensely rewarding, with very little chance of getting into any serious peril. The World Heritage site is popular with local Chinese tourists, even though the entrance fees are quite high. Although this national park is located in the world’s most populated nation, it’s still possible to feel the immense power of nature – geological marvels will never be surpassed by human built buildings. Our journey involved a very civilised Cathay Pacific flight into Hong Kong and then onto Changsha with Cathay Dragon. Changsha is a fascinating “small” Chinese city of 5 million people in Hunan, which I will blog about another day. After a busy weekend in this city, we took a local six hour train journey to Zhangjiajie city, which is about 40km from the national park of the same name. The train journey was enjoyable and comfortable, although we discovered that “No Smoking” signs are a suggestion rather than a prohibition in China – even the staff were puffing away in the corridors of the non-smoking section of the train. We experienced passive smoking inside the cabin, contrasted by views of harsh industrial city landscapes, dry rice paddies and endless orange groves. That’s a brief summary – but it was really amazing to trundle through a seemingly timeless rural landscape in China. Finally, the train passed through dramatic deep gorges along a long river until its arrival in Zhangjiajie city, which was formerly known as Dayong. Departure area of Changsha Railway Station – very organised and clean. Matching your ticket with the platform and time is essential, although the locals were quite eager to help out. It’s still another 40 kilometres from Zhangjiajie city to the World Heritage Geo-park. Upon arrival at the railway station, we were thankful that we printed out a Chinese translation of our hotel’s location for the taxi driver. Our basic Mandarin skills were comical but useful in organising the 40 km journey to Wulingyuan, which is the main tourist town on the edge of the World Heritage park. We were spooked by the taxi driver, who took us to the hotel on a new freeway that was quicker, but a long diversion off the old main road. At one stage, I was worried that we were being abducted. Looking back now, I do realise that I may have been overly paranoid – I reckon it’s quite difficult to abduct and murder white tourists in China without other people noticing, as you are always the centre of attention outside the big cities. The Pullman Hotel was beautifully appointed and highly recommended – only ten minutes walk from the main entrance to the park. We arrived late in the evening and slept well, after a long journey. Gardens in the Pullman Hotel, Wulingyuan – very well appointed with a small contingent of helpful English speaking staff. Wulingyuan town is next to Wulingyuan Scenic area, which is a vast 690 square kilometre section of the World Heritage area with over 3,000 quartz sandstone pillars that rise above deep gorges. 243 of these peaks are over 1,000 metres high. The mountain tops and cliffsides are covered in dense forests – quite different to the Grand Canyon in the United States, but equally inspiring. There are a wide variety of hiking tracks for all abilities and park amenities are very well maintained, even on the longer hikes that traverse more remote corners of the park. Sometimes it feels like beautiful places are being loved to death. As it located in China, I soon appreciated the huge challenges of balancing tourist visitors and protecting the environment. The local authorities have taken some courageous decisions to prohibit private vehicle travel in the park, which is quite sensible in a country of 1.3 billion people who are keen to travel here. However, there is no way to avoid crowds in some parts of the park, as you are in the most populated country on the planet. For foreigners, travel within the park can be challenging, as there are a series of bus routes, cableways and elevators that takes the majority of tourists on a massive circuit of the park. It’s much like IKEA on a weekend, except slightly larger – once you start the big circuit, it was be difficult to find you way to a specific section. And the names of places and things are just as mysterious as IKEA as well! On day one, we took the main route from Wulingyuan town, by bus to the cableway that goes up Tianzishan (Tianzi Mountain), before boarding another bus to the western side of the park over mountain ridges. The scenery is spectacular and we were glad we arrived at 8am sharp to avoid the crowds. Dramatic cableway ride through the canyons up to Tianzi Mountain – there was a huge diversity of beautiful trees that were breaking out in autumn colours. Upon arrival from the cable car at the top of Tianzi Mountain, we were amazed by a series of lookouts with views over many strange, remarkable rock formations. The top of the mountain is heavily forested, so it’s really pleasant for a leisurely stroll. And, yes, it does have a McDonalds, much to our initial disappointment, but we do confess to getting an iced coffee later in the day. The views are incredible and the names given to the the rock formations also conjure up magical Chinese images: Imperial Writing Brush Peaks, Mouse Watching the Sky, the Celestial Bridge, the Turning Head Lion and the Warrior Taming Horse, amongst many others. After Tianzishan, we boarded another bus to continue the IKEA circuit. The buses leave every five minutes, so we stopped off at some intermediate bus stops to soak up the silent mountain atmosphere. This is highly recommended if you need some peace and solitude. Another short bus journey delivered us to an area that allegedly inspired some of the floating mountain landscapes from the Avatar movie. Thankfully the landscapes are more inspirational than the storyline of the movie – the hiking was spectacular, despite being busy – beautiful forest landscapes, dramatic cliffs and deep canyons. One natural sandstone bridge crosses over a gap that is 357 metres to the valley below. A celestial bridge crossing a deep sandstone canyon that almost defies imagination. Although its very popular and crowded, the grand scale of the mountains still enable an enjoyable visit – locals have placed red tags along the pathway. After hiking along the top of the dramatic cliffs in the afternoon, we realised that all pathways funnelled everyone to the end of a cliff where the authorities have built a huge elevator that takes you down to the bus station exit. Unfortunately, the elevator is an “optional compulsory extra”, costing over US$20 for a 40 second ride down the huge cliff. (There was also a huge line up). We would have been quite happy to walk down a stairway, but this did not appear to be an option on the map. I’m glad we had our credit card handy, as otherwise we may have been abandoned on a mountain top when the sun sets. All part of the IKEA Chinese National Park Challenge I guess. To sum it up, the scenery within this World Heritage listed park is truly remarkable, and still enjoyable, despite all the discomfort and crowds that are common in China. Our visit in November was not too crowded, in comparison to other places we have been in China. However, navigation can be challenging and food options can be limited, so you really need to be a keen outdoor person to appreciate this park. If life is about memories – little snapshots in your mind – like photographs – Zhangjiajie certainly delivers. The memories of these landscapes still hold an emotional tug in my heart: I still have an emotional reaction to the first time I stood on the edge of these cliffs and experienced the wonder of this park first hand. China is yet to be bombarded by occupational health and safety political correctness. UNESCO Listing on Zhangjiajie: Details on the park and it’s significance to the planet. China’s Ancient Skyline: An informative article on Zhangjiajie, by the New York Times in 2007. Ctrip train booking site: Excellent booking service for train tickets in China. Tickets can be purchased with foreign credit cards, for collection in Chinese cities when you arrive in the country – print off the confirmation and collect at any train station in China. Very reliable and safe website. 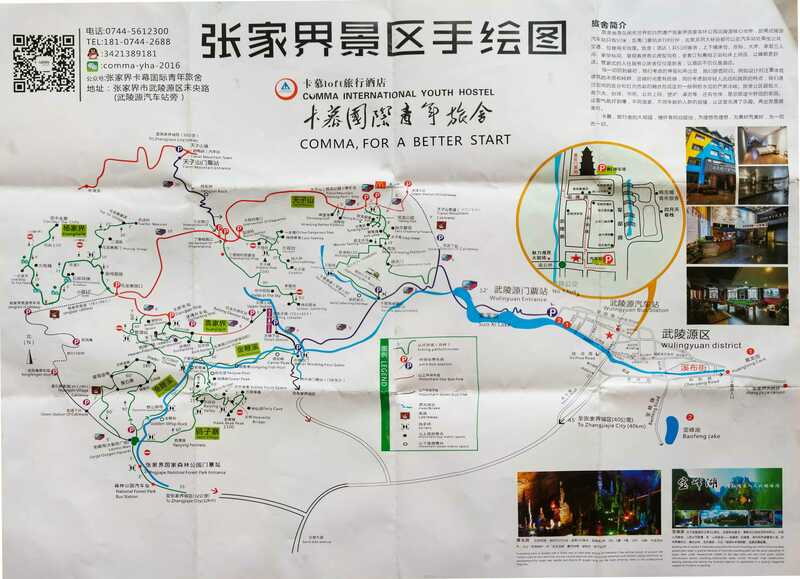 Basic map of Zhangjiajie: This map of Wulingyuan Scenic Area may seem a bit confusing at first, but you soon learn to go with the flow. Our Hotel in Wulingyuan: Pullman Zhangjiajie – this well established hotel was located in a town on the edge of the park. There were many other hotels nearby, catering to all budgets. If you stay in Wulingyuan there are plenty of food options, especially for the adventurous diner. Singapore is known for it’s built environment and impressive economic power, but not necessarily wild places. It’s an amazing city, but given it’s limited space, it is difficult to experience the true magic of wild untamed places. However, if you are after some real wildlife in an amazing wetland reserve Sungei Buloh Wetland Reserve is the place to go. To be expected – a long list of “Don’t” in Singapore, along with some of the amazing local birds in the dense tropical forest. Although the entrance sign has a big list of restrictions, once you get into the park it’s easy to see that Sungei Buloh is a natural environment – not a zoo or bird park. The tranquility and jungle atmosphere of Sungei Buloh make it hard to believe you are on the edge of this crowded modern city. It is totally different to other places in Singapore, away from the stressful crowds. Aerial walkways have been built through the mangroves that grow along the extreme edge of the coastline. Sungei Buloh is on the north west edge of Singapore, but it is still within a 60 minute taxi ride from Changi Airport and even less from the city. My visit started before the 7am sunrise in the Western Car Park. Another option would be a sunset visit, if you want to avoid the harsh midday heat and humidity. Birds and animals are smart – they avoid heat conditions so early mornings or late evenings are the best time for exploration. A large tower has been built so visitors can look out over this amazing wetland. Walkways also allow easy access through the densely forested landscape. The reserve has amazing facilities that respect the habitat. Pathways are well maintained but they are humble & discrete – you still get close to the birds and animals that live here. Pathways cross through crocodile infested mangrove forests in addition to lowland swamps: some boardwalks also rise up above the mangrove swamps, so you get a unique view of this amazing tropical environment. A local squirrel in the dense undergrowth of the tropical jungle. I started my journey from the main entrance at dawn – although it was very early, an eager park ranger provided me with excellent maps and information on the wildlife that was seen recently. You enter the reserve by crossing a bridge across a channel. Walkway to the wetland reserve. Once you are in the reserve, there are many paths that pass through dense tropical jungle. This landscape is loud – a place of suspense and loud noises. Insects constantly buzz and birds sing loud aggressive songs. there are few early morning visitors as I think most Singaporeans wake up late. It possible that a crocodile could jump out of the water and drag a visitor into the murky water – so its a good idea to keep to the marked pathways. Sungei Buloh is amazing for the sheer density of wildlife activity. Within an hour, you should be lucky enough to see heaps of birds, within a very short walk of two or three kilometres. The main track goes around two or three lagoons that are linked to the sea – it follows the coastline, along the Strait of Johor. This is another aspect of this walking trail that is interesting to foreigners who visit Singapore, as you can look out to the north and see Malaysia within 500 metres. Singapore has a wildlife reserve here, while large apartment blocks have been built along the coastline on the other side of the strait. Many Malaysians live in these apartments and do a daily commute into Singapore. Seems line a stone’s throw to Johor in Malaysia. So close but another country. So what makes Sungei Buloh really special? It’s the birdlife. It’s highly likely that you’ll see amazing tropical birds within a very short timeframe in their natural environment. Within the canopy of the dark forest, Laced Woodpeckers and Stork-billed Kingfishers can be seen, along with White-Breasted Waterhens. On the waterways, herons and egrets are common – as they are smart enough avoid the crocodiles. In terms of international travel, birds are like humans – they love a Singapore stopover. Singapore is an important point for many waders and sandpipers that stopover for their long journeys from the northern to southern hemispheres and back again. Wimbrels are a common visitor on their long flight from Siberia to Australia and other parts of South East Asia. Whimbrels are a common visitor to Singapore’s Sungei Buloh Wetland Reserve – although do not have the luxury of flying on Singapore Airlines! My early morning visit also included an encounter with some of the local residents – larger storks and herons on the open waterways and lagoons. In terms of the storks, it’s so sad to think about them being threatened by people, even though they deliver our new born babies to their mothers. They are a gentle and graceful bird that has lived in harmony with people for many generations. However, storks are facing tough times in this part of the world, as Indonesia and Malaysia are developing rapidly – only a stone’s throw from Singapore. My heart really went out to these storks, as their population has dwindled significantly in the past few years to less than 1,500 individuals with the rapid development of Sumatra, which is only a short distance from Singapore. Coastal mangrove habitats are being rapidly replaced by bland residential developments – destroying any chance of supporting a widespread stork population. While experiencing an encounter with these beautiful creatures in Sungei Buloh is an uplifting experience, it’s easy to be overwhelmed by the depressing reality of their demise if larger habitats are not saved. We are lucky that this location in Singapore is being beautifully maintained and monitored by the national park service in Singapore, especially given that it is so important to migratory birds and local birds that are under increasing threat. If starting before 7am, get a grab, which is the local version of Uber – easy to install and use on your mobile phone. Alternatively get a cab. After 7am to late evening, Sungei Buloh is also served by the 925 Bus which runs every 10-13 minutes from Kranji MRT station. This takes you to the edge of the reserve on weekdays, with an extension to the centre of the reserve on weekends. Today is my first step into the online blogging world. If you are like me, it’s great to travel and explore. However, there’s nothing worse than beautiful places that are ruined by big crowds. That’s why I want to share. About places with personal significance. Places we can reflect and have some quiet time, connecting with the real world and getting a sense of history. Let’s start close to my home – at Abbotsford Convent and Collingwood City Farm. So close, but it’s a place of amazing natural beauty along the river, with a historic farm and a unique place in the social history of Melbourne. And it’s generally off the main tourist track, which makes it even better! from a ridge on the other side of the Yarra River. The Yarra River meanders through Melbourne with low gorges and grassy river banks along the majority of its length. The intersection of the river with Merri Creek was used by the Wurundjeri and Kulin Nation peoples for thousands of years as a meeting point, prior to the suburban spread of Melbourne today. Forests and grassland still run along the river even though its only 4 kilometres from the centre of the city, so it’s not hard to appreciate the natural beauty that the Aboriginal people loved and cared for in this part of the world. The bushland forests along the river are still a haven for birds that live here. With a little exploration and patience it’s quite easy to see some very interesting native birds so close to the city. I once spotted a Tawny Frogmouth (Podargus strigoides) on a branch of a eucalyptus tree above the water. These rather ugly, bulky masters of disguise are not owls, but nightjars. They sleep during the day and prey on small animals, lizards and insects at night – hunting by stealth as they remain still in the treetops before swooping down for the kill. The convent and parklands are home to a wide variety of boisterous parrots, but the Red-Rumped Parrot (Podargus strigoides) is one of the quieter parrots in the area. I’ve seen them feeding in groups on grass seed, in addition to wandering across the pathways and cycle tracks. The male is righter than the female with a bright red rump. In addition to retaining connections to nature and birdlife, this area is historical significant to Melbourne. Imagine the 1860s: a gold rush has totally transformed Melbourne with huge population growth from 25,000 in 1850 to 500,000 in 1861. The majority of new arrivals dreamt of striking it rich with gold, but the reality was different – a small town was transformed into a big city, with all its social problems when most people don’t have a regular income. This is a time when the church saw the social problems and opportunities to expand their reach. Four nuns from French managed Sisters of the Good Shepherd arrive in Melbourne in June 1863. Cashed up, they knew good Catholic Church real estate when they saw it – a convent was established on the banks of the Yarra River on this site. So were the beginnings of an institution that still exists and supports the Australian community today, in a manner that has moved with the times. In Abbotsford, they built huge Victorian buildings, that would have scared young women and children who were very vulnerable in the social upheaval of gold rush Victoria. The buildings became grander as the convent’s business enterprises expanded. Most of these buildings can still be explored today – most notable is the Convent Bakery with its wood fired mansonry ovens, which are still in use. Convent Cafe in morning sunshine on a clear winter day. Despite the calm relaxed setting of the convent grounds today, life was difficult for people who lived there in the past. The convent operated from the 1860s to 1976, largely secluded from the outside world, but also a integral part of the social and legal justice system at the time. Women who were caught up in petty crime or unsupported by families were incarcerated against their will in the convent with the support of the legal system. The nuns ran various enterprises with this free labour, with extensive farming activities around the main property, in addition to operating businesses like large laundries, which were used by Melbourne hotels. It will we are sure be most gratifying to our readers and the public generally to hear that the much needed and useful institution for the reformation of fallen females at Abbotsford, under the care of the nuns of the Good Shepherd, is quietly but effectually fulfilling its mission.There are at present a large number of inmates, and in addition to the spiritual instruction they receive from the good sisters, are daily employed in the various occupations that are likely to be useful to them in after life. Needlework in all its branches is carried on, and a public laundry is being established and will be in operation in a few days. It is intended to have a conveyance and wait on families and hotels weekly, and as the nuns expect to be able In time to make the establishment self-supporting, this In itself ought to be a strong inducement to the virtue-loving public to co-operate in such a praise worthy undertaking. An English Oak tree, which was planted by the nuns in 1952 to commemorate QEII’s ascension to the throne. This institution has been subsequently signalled out as a place where people who lived here suffered terribly, so it can be quite a solemn experience to wander these grounds and reflect on how lucky we are today. Convent life eventually ceased in 1976 as social conditions changed. Few nuns were available to run the institution. But the history of this site from that time also mirrors social and environmental changes of Australia since the 1970s. The Whitlam government funded the purchase of the site, but it always suffered from a lack of funding for upkeep of the buildings. Up to 1989, the farmland was separated from the convent buildings, which were used by La Trobe University. When the university departed, things took a darker turn as a major developer purchased the site with a proposal for large apartment complexes. This proposal led to substantial community opposition with the formation of the Abbotsford Convent Coalition, which successfully battled to protect the site as a community asset for everybody in the years up to 2004. Restoration of the site has been fairly slow, as it is large and rambling and it is largely supported by not-for-profit enterprises. In 2017, the site gained a National Heritage Listing. Nowadays, the site if home a lively social enterprises, art exhibitions, a farm for children and a place for community gatherings. PTV Website: Catch a Mernda or Hurstbridge line train to Victoria Park Station. The train station is a 10 – 15 minute walk to the Convent, or you can catch the 200 or 207 bus to Clarke Street, Abbotsford. Note: some peak-hour express services on weekdays skip Victoria Park Station.